This month we featured an eclectic mix of pest control articles, which included, a review of two Industrial Pest Control events on opposite sides of the globe - PestEx UK and the CPCA event in China; a discussion on the minefield that is the EU regulatory environment; how carpenter ants can be destructive in Norway; the origins of pesticide smoke generators in Spain; and the trials of a new A&K fruit fly system. We feature two ongoing Forestry stories that although based in the UK, have a resonance across Europe: the ongoing march of the Oak Processionary Moth and spread of the Chalara, Ash tree die back fungus. 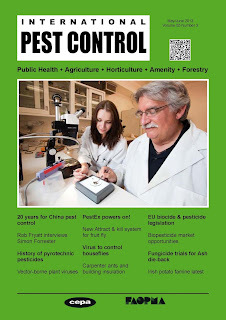 We continue to develop the IPC magazine content and should anyone feel they have a contribution to make in the form of a technical paper, a press release, news story or just want to respond to something you have read in this month’s issue, please do get in touch with me via editor@international-pest-control.com. The benefits of insect pheromones and monitoring tools are still little understood. 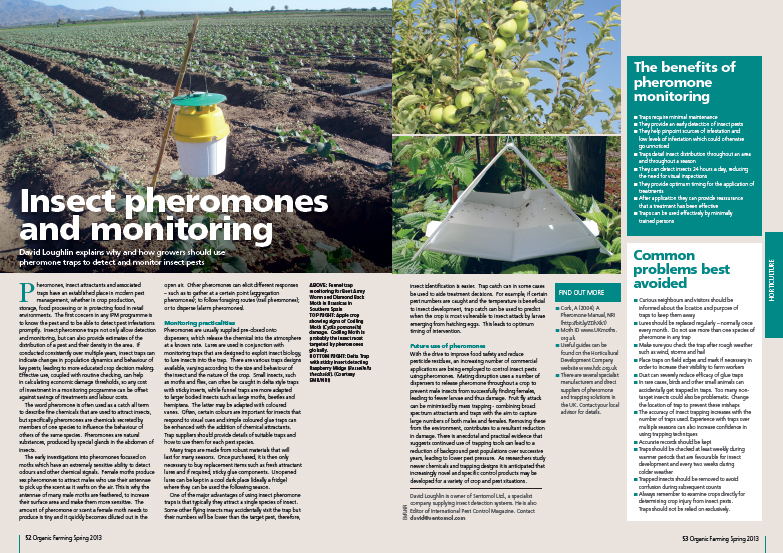 In an effort to help explain the basics and encourage more of the UK to try these IPM solutions, the following appeared in Organic Farming magazine in Spring 2013. Horseflies, breeze flies, clegs or clags, deer flies or gadflies are all common names for members of the insect family Tabanidae that habitually attack humans and livestock and are widely regarded as pests because of the bites they inflict and the diseases and parasites that some species transmit. Surprisingly, adult flies normally feed on plant nectar and pollen, but female flies also require a blood meal before they are able to reproduce effectively and to aid in their egg development. Female horseflies have specially adapted mouth parts which they use to rip and slice flesh apart. Males do not. 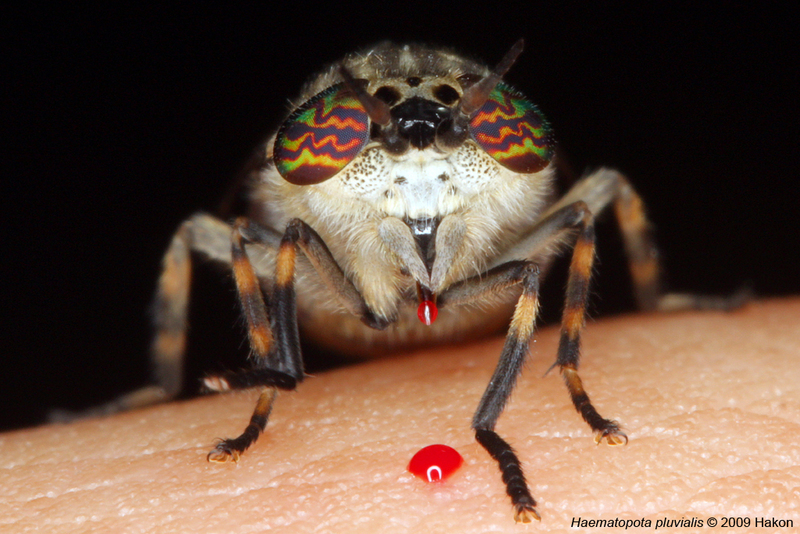 The bite causes the blood to seep out so the fly can lick it up. It is a secretive insect, with an annoying ability to land without being detected and escaping before the victim begins to experience any pain. The subsequent bite can be extremely irritating. The female horsefly’s primary sense for locating a suitable prey is by sight and they have large compound eyes that serve this purpose well. They are attracted to large, dark objects, to certain animal odours and carbon dioxide. They are also attracted by motion, their eyes being well adapted to its detection. 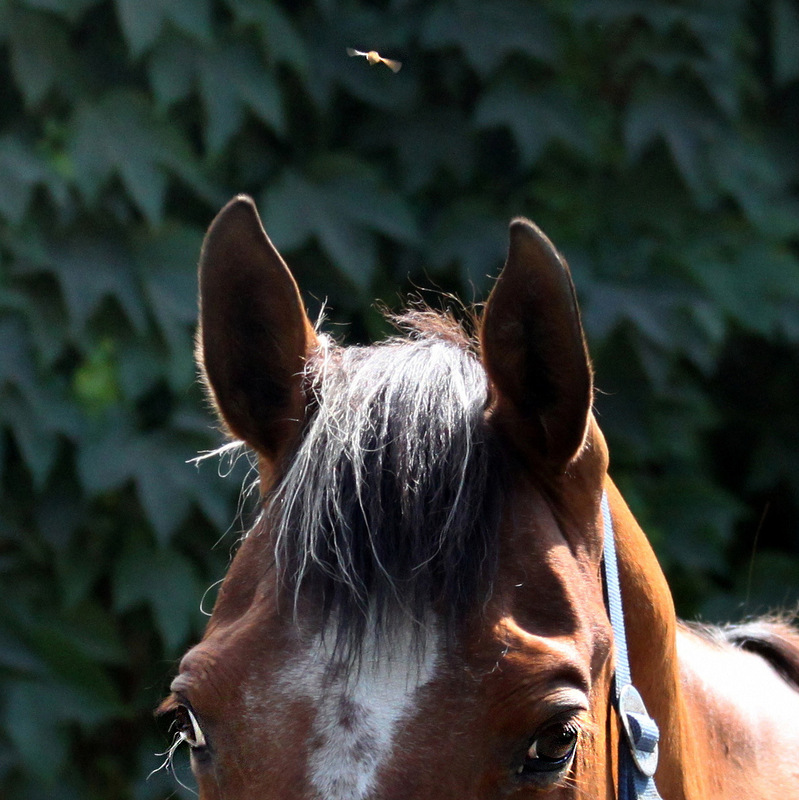 Horseflies are most active in hot weather, mostly in summer and autumn during the daylight hours. Most species also prefer a damp environment, which makes it easier for them to breed. Eggs are generally laid on stones close to water or on plant stems or leaves and on hatching, the larvae fall into water or moist earth, feeding on other invertebrates, such as snails and earthworms. The new H-trap system is an effective control solution aimed to reduce horsefly numbers to an absolute minimum and comes complete with everything needed to be erected (except a hammer to drive in the ground spike). The H-trap is designed to be placed outdoors, where it works without the need for chemicals or electricity. The attraction is purely physical. Extensive independent trials have shown that with continued use over several seasons, there is potential for a reduction of 90-95% in horsefly numbers in areas protected by the H-trap. As the female horsefly’s primary sense for locating a suitable prey is by sight, they are attracted to large, dark objects and by motion, their eyes being well adapted to prey detection. The H-Trap mimics an ideal target for horseflies to land upon. A free standing structure, the H-trap comprises a metal frame from which is hung a large black plastic ball and a funnel trapping mechanism. The insects are tricked into mistaking this ball as a large animal, such as a horse. They are attracted to the ball since it warms in the sunlight and emits infra-red radiation or heat, exactly like the body of a large animal. Once they land on the black ball, they will investigate and try to bite it. Since they will be unsuccessful in finding a blood meal, they will follow their natural behaviour and fly away. As horseflies naturally fly upwards on take off, they are caught in the surrounding hood system and funnelled upwards into a centrally placed collection bin, where they are caught in soapy water and die.